Went down to Roaring River this morning with my two best friends. Pat my bro and Marshall. We had a blast!!!! We findly got tired of counting fish!! That's a great day when you get tired of catching but everyone knows that the catching is icing on the cake!! It was cool early but was not cold. It never changes on the Killer worm catch a ton! I caught 3 about 3lbs and Pat had one nice one and so did Marshall. Talked to Tim a minute and he wasn't kidding about using the big ugly flys!! He tied on a orange and white bouble bunnie and the bigger fish went crazy! This thing was 4 inches long!!!! Roaring River is still one of the prettest rivers anywhere. There were a lot of people fishing and walking around soaking up the beautiful day! Lot's of people asking about fishing regs. 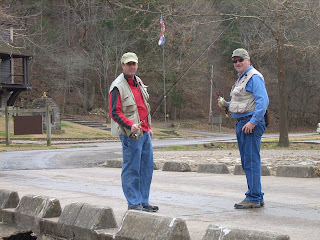 Fishing permit and trout stamp is all you need. The Good Lord has blessed us with a lot that we take for granite! Look around sometime and really look what we have and remember he's given this to us!!!! Well catch and release season finely opened last Friday. I had a great day to start. My first fish was a beautiful 5lb rainbow! I caught about 40fish in 4 hours and 7 of them were between 2lbs and 4lbs. Beautiful day weather wise. I used the Killer worm all day. This Friday I went down after I got off work at 11and got to fish a couple hours. Caught 21fish and had one 3lb and one 4lb fish. Met up with Gary Bates and got to see him land a nice 3lb fish. Last Friday I got to net a sweet 8lb rainbow for a gentalman from Pittsburg KS. He said that he had been fishing RR for 41years and findly caught a 3lb fish last summer. Well you beat that one by a ways!! My brother took my dad down last Monday morning and he said he stopped counting after 30fish. Killer worm is in deed a KILLER!!!! 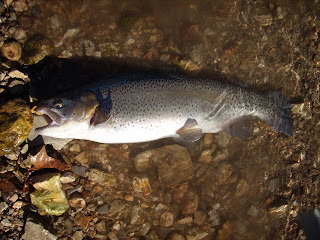 I'm posting a picture of one of the nice rainbows that I caught. It was a great weekend. I got to go up to Bennett Springs Saturday morning. I met Marshall and Mike at the Store about 7 and we were ready to go. We went up and started around the spring and the water was a little high but clear. It didn't look like there were too many fish in the river. No matter!!! I was fishing!!!! I fished around the spring for a while and then started my walk about. I ended up below the big bridge in the shallow swift water. I threw the Killer worm at them and they responded. Caught 25 till 10am. Fished it under a palsa about 3 feet and a small shot about 1foot above the Killer!! Went up to came and saw the rest of the Robbs and Watsons. It was great to see and talk to everyone!!! Ellen your growing up way too fast!!! Stewart your a wild man!!!! Cindy you haven't changed a bit!!!! Mike it was great to meet the rest of your family!!! Great bunch!!! It was a great weekend!!!! Fish Fun and home to my family!! Doesn't get any better than that!!! Well it's been an interesting week. I was ask to talk at the local Rotary lunch this week. I saw a lot of familiar faces and had a good time with them. They had a lot of great questions and I hope I got them the answered good enough. I talked with a friend from St Louis also this week. He had a great trip to Bennett last week and did pretty well with tough conditions. He did quite well with the killer worm!! I hope to get to go down to Taney and visit with them at the end of the month. That brings me to Taneycomo. The water is lower on Table Rock and that means FISHING!!!!! But of course I've got 8 rods to finish and I can't go!!! They have been catching a lot of nice fish. Roaring River is still up and stained. They are turning loose some lunkers every Friday evening so if you want a shot at one be there Saturday morning!!! Well we are getting ready to go to see the Roberts. We will be gone until Monday evening. Hope everyone is fishing and catching!!! Taney rules!! !